Project management is the core of all our project engineering solutions. It is embedded in a flexible, interdisciplinary, international organizational structure that is defined according to the project's degree of difficulty and complexity. Our teams of experienced engineers manage the project through all stages of development, from idea conception to solution delivery. New investments and capital spending on replacement are carried out on the basis of feasibility studies and detailed specifications. Utilizing state-of-the-art planning aids, our experienced professionals follow a project methodology that focuses on risk mitigation, governance, and strict adherence to clearly defined project goals and objectives. Our team will ensure that significant value is provided to our customers through the on-time, on-budget delivery of quality solutions. Profi-Vision sees itself as a customer-oriented service provider. Great emphasis is therefore placed on offering the best possible service, especially in the event of emergencies when fast and reliable assistance can make all the difference. Our basic engineering services include feasibility studies, audits, planning, design, and development of computerized automation systems related to the process control and power distribution industries. A team of Profi-Vision engineers manage the project through all stages of development, from idea conception to solution delivery. Our consulting staff combines managerial expertise, technical capabilities, and financial and business knowledge to provide comprehensive services to ensure we help our clients meet their business objectives. We carry out the planning, design and integration management of Computer Information Systems, Local Area Networks (LAN), and Wide Area Networks (WAN) to support Supervisory Control and Data Acquisition (SCADA), Human Machine Interface (HMI), and Real-Time Database Systems.A further important area of ours is the development of software requirement specifications for Graphical User Interfaces (GUI), Operator Interface Work-stations, database logging, reporting, and computerized control algorithms to be implemented by system programmers. WinCC, Wonderware, FactoryLink, Intellution, RSView and various HMI packages. Microsoft OS, UNIX, SQL, Maximo and various application programs. Energy Management, Peak Demand, and Optimization. Software engineering services include control system migrations, new control system layout and design, as well as historian and business system integration. Our teams of experienced software engineers manage the control system software development through all stages of the project, from customer specifications to final installation and validation. With years of process knowledge, our engineers not only program the control system to the customer specifications but are able to offer process optimization suggestions throughout the project. Hardware engineering services are developed on the basis of feasibility studies and detailed customer specifications. Our experienced engineering teams always develop the hardware detail engineering together with the customer and with the installation process in mind. Customer-specific hardware tools enable the best project development at the lowest cost. The customer can always rely on the know-how and experience we have assembled through years of working with various CAD systems. Computer virtualization is valuable tool with many uses in a control system. As a VMware Solution Provider, Profi-Vision staff has extensive experience in virtualization partial control systems, complete control systems, historical archive systems, and lab data management systems. The benefits of virtualization can be realized when implementing new systems and by converting existing systems to a virtualized platform. After the project engineering has been realized, it means nothing unless it is installed and tested correctly. Our experienced on-staff hardware and software engineers are trained to support each project through the installation phase. This includes preparation and execution of installation and demolition drawings, designing operating procedures, system startup and validation, and finally providing detailed and accurate final documentation of the commissioning. While selling engineering and automation components is clearly an important aspect of what we do, our customers can also rely on excellent after sales service. 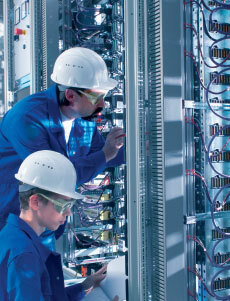 It is this service that demonstrates the true quality of our installations and systems. And providing this system to all our customers is one of our most important corporate principles. To help reduce any unplanned downtime, our committed technicians offer the best possible service, especially in the event of emergencies, when fast and reliable assistance can make all the difference. We also maintain spare parts and employ the latest communication technology to ensure that we can always meet the needs of our customers.